While I was walking over the past month, during the slow times I'd turn on MP3 player and listen to "The Bridge," a biography of Barack Obama. According to author David Remnick this quote is one of Obama's favorites. 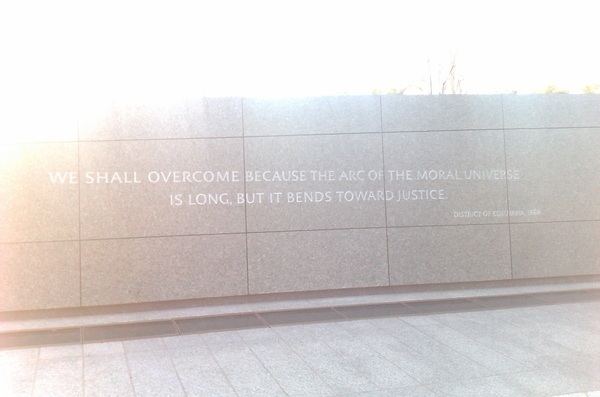 Serendipitously it's one of the sayings engraved at the Martin Luther King, Jr. Memorial. It reads, "We shall overcome because the arc of the moral universe is long, but it bends towards justice - District of Columbia, 1968"
We didn't see (or look for) the controversial self-aggrandizing quote, "I was a drum major for justice, peace and rightousness," which will be soon be effaced and replaced.